"Daily" will book an appointment 7 days a week using the criteria selected in the form. "Weekly" will book an appointment every week using the criteria selected in the form. "Bi-Weekly" will book an appointment every other week for the criteria selected in the form. Choose an End Date (Optional): You can chose to set an end date for a repeating appointment or allow it to continue indefinitely. 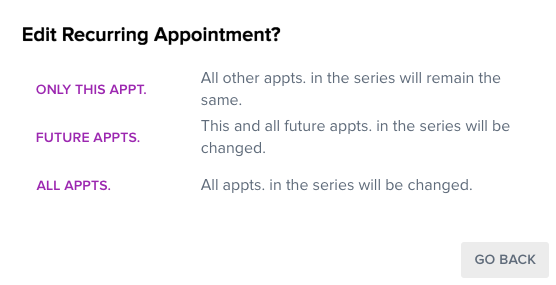 When canceling "All Appts," only the most current non-completed appointment will be saved as a canceled appointment. All other instances will be removed completely from the system. When applying a cancelation surcharge, only the above mentioned appointment is charged a fee. When canceling "Future Appts." only the selected appointment will be saved as a canceled appointment. All other instances will be removed completely from the system. 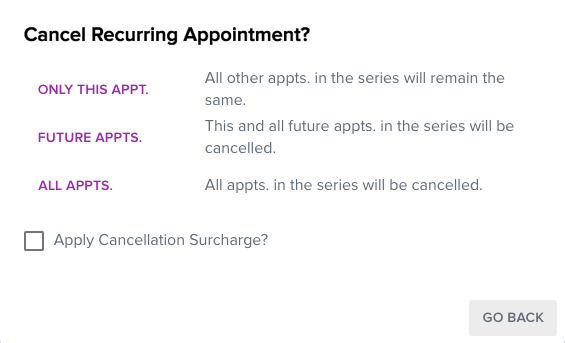 When applying a cancelation surcharge, only the selected appointment will be charged.